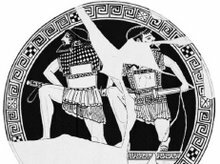 Recently, a friend of mine, Helena Schrader, who has written many novels set in ancient Sparta with an eye towards dispelling much of the mirage that has been built up around Spartan history, asked me a question on something I posted on her website. I decided to turn her question into a guest spot, giving you both her initial question and my response. Many of you have already followed the link from my site her hers, and I recommend those that have not done so take the opportunity now. She has a new trilogy coming out centered on Leonidas's life. Now, Plato has something of a reputation for paying more attention to his Rhetoric tutors than his history lessons, so of itself his statement is less than compelling. There is a whole suite of circumstantial evidence to back up Plato’s assertion, that in total make an argument that some believe is sufficient to prove a revolt, while others remain unconvinced. Drs. Lazenby and Cawkwell believe in the revolt, while as of the time of his book Sparta and Lakonia: A Regional History, which I draw from for this entry, Dr. Cartledge was agnostic. First, at Olympia the Spartans dedicated spoils from a war with the Messenians. Pausanias writes that this was dedicated after the second Messenian revolt, which would be the revolt in 465 BC, following the devastation of Sparta by earthquake. L. H. Jeffery (JHS, LXVI 1949) showed that the way in which the letters were formed in the dedication could not have been used as late a 465, thus there must have been a “messenian war” before this, but not so early as the first revolt in the early 7th C.
Second, there is a tripod dedicated at Amyclai by Callon to success in a Messenian war. “There are also bronze tripods. The older ones are said to be a tithe of the Messenian war” (Paus. 3.18.7). Callon is thought to have been active at around the turn of the 5th C.
Third, we have a statue dedicated to Zeus, again noted by Pausanias (4.33.2) “The statue of Zeus is the work of Ageladas and was made originally for the Messenian settlers in Naupactus.” But Ageladas worked in the early half of the 5th century and not as late as 460. Fourth, Anaxilas, an early 5th century Tyrant of Rhegium in southern Italy along with a group of Messenians seized and Zankle in north-eastern Sicily and renamed it Messene in 489-88 BC (E. S. G. Robinson, JHS LXVI 1946). Fifth, Aristomenes was a Messenian hero from Andania (Paus. 4.14.7). He has been variously dated to the initial subjugation of Messena in the late 8th c, the first revolt some 40 years later, and by the Hellenistic poet Rhianos in his Messeniaka to the late 5th century. A web of evidence including the lives of supposed descendants that has become known as the “Rhianos Hypothesis” supports this later date. For example we are told one of his daughters married Theopompos of Heria, who was an Olympic victor in 284 and 480 BC. Lastly, there are dedications by ” Messenians” at Delphi in the early 5th century. These and the various instances of the movements of Messenians to colonies could reflect an uprising and its later defeat by the Spartans. Why there should be an uprising at this time is easy to imagine. Surely the Messenians knew by 491 BC that the Persians were coming. One wonders, if the revolt is fact, if it was coup of the Persians or their allies. There is one last possibility I should mention. Cleomenes I gained the Agiad throne in about 520 BC, and was perhaps one of the most interesting Spartans Kings. As was common with Spartan royalty, he was often at odds with the Spartan legislature. Spartan Kings were severely limited in their power when not on campaign with the army. What they did have were powerful factions within the citizen body politic. More than most, Cleomenes I was ruthless in his politics. His actions led to the famous dethroning and defection of Damaratus to the Persian King’s court. Later, at a moment of political weakness, his foes attacked, leading him to flee to Arcadia- perhaps by way of Sellasia not Thessaly. There he appears to have been rallying the Arcadians. His modern advocates look to this as a great panhellenic gesture in preparation for facing the Persians. Perhaps I am less generous, but the examples of Damaratus, Lysander, Cleonymus, and his namesake Cleomenes III, all make a direct use of this Arcadian base as a pawn in a power play for Spartan power likely. Remember, this is the man who once famously termed himself an “Achean” in an Athenian temple. If he was rousing Arcadians, is it impossible that there was also some intrigue with Messenians?